Children are taught the importance of selecting from a range of mental strategies to solve mathematical problems. Emphasis is placed on practical and oral work and mental computation as well as the application of principles and knowledge to everyday situations. In Years 1, 2 ,3 and 4 children are placed in ability groups for maths so they receive the highest level of support and challenge. Big Maths puts the child at the heart of the learning experience. Don't be surprised if your children come home talking about Clic, Pom, Pim, Squigglesworth or Count Fourways. They will be talking about Big Maths which is being introduced throughout Perton First School. Big Maths helps children to understand the links between core numeracy (the basic principles that underlie all maths) and outer numeracy which is the application of these core principles. Children will count forwards and backwards in all kinds of steps depending on their level e.g. in 1s, 2s, 3s, 6s or even 25s! When practicing counting at home with your child, make sure you go forwards and backwards. Don’t always start at 0 – make sure they can count on from 75 to 106 for example. 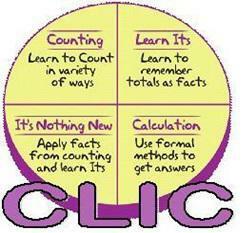 This is the most important aspect of CLIC. It is the way children become successful and properly numerate. The idea that 5-things and 3-things are always 8-things is a fundamental concept. Once children understand this concept, we can change the ‘thing’ to other units, e.g. ‘tens’, so that 5 tens + 3 tens = 8 tens. 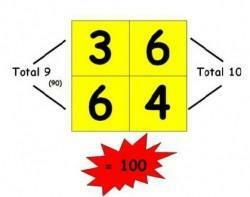 Children begin to learn the concept by counting random unit e.g. bananas, aliens, cats etc. It then becomes much easier to use standard measures such as ml, m, cm, kg, whilst understanding the underlying number concepts. The idea is that the 'learning is nothing new' and children feel able to answer all sorts of questions with real understanding e.g. if a child knows double 4, they can use that to find double 40 with confidence. 'Where's Mully?' is a gamw that is played to help children master division, which is traditionally the most challenging of the four operations. 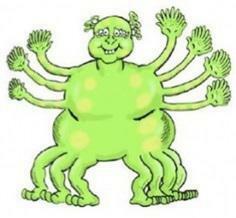 Mully Multiple hides behand numbers in a number square and the children have to find him. e.g. He's hiding behind the biggest multiple of 3 without going over 40. Where's Mully? He's on 39! The word 'division' is introduced later! Let's Meet Some of the Big Maths Characters! 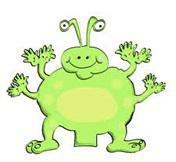 This friendly alien is Pim. The 'Principle of Irrelevant Matter'! That means that number facts stay the same and it doesn't matter what you are counting. Pom is Pim's friend. 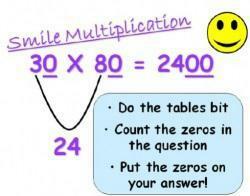 He helps children to learn the maths they need to enable them to talk about their maths. The space on his tummy is for multiples. Squiggleworth is the Place Value Pet! What is that squiggle worth? Mully helps is to put numbers in order. Count Fourways challenges you! Count Fourways helps your children to count along different number lines. 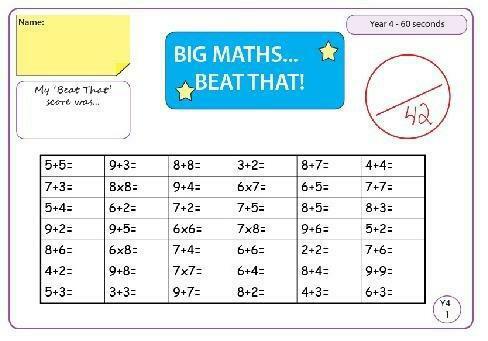 Big Maths Beat That is a weekly times test of your child's Learn Its. The aim is to improve their individual score each time. Help your child practice their Maths at home – a few minutes a day is all you need.